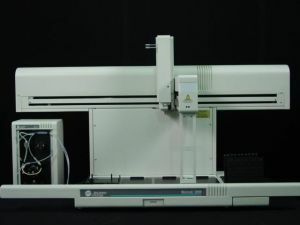 Biomek® 2000 Laboratory Automation Workstation Years of reliability, versatility and innovation have made the Biomek 2000 Laboratory Automation Workstation the benchmark system for BioRobotics in Pharmaceutical, Human Genome and Bioresearch laboratories worldwide. Virtually any liquid-handling procedure can be automated with the Biomek 2000, controlled by powerful and easy-to-use BioWorks™ software. The Biomek 2000 Laboratory Automation Workstation meets the demands of rapidly changing life science technology with simple, intelligent automation of liquid-handling tasks. Pipetting, diluting and dispensing operations are performed quickly, easily and automatically. The modular platform allows expansion of system capability to include plate heating and cooling, plate washing, high-density transfers, photometric measurement and high-capacity operation. The entire system is controlled by powerful and user-friendly BioWorks software with an intuitive graphical interface. to request a complete list of specs. Save 30-50% By Calling Today!